As the world’s largest trading partners, Canada and the United States share a diverse and highly integrated economy. However, many North Americans are unaware of the depth and breadth of this interdependence and the importance of successful border management to both countries. Today, the complex flow of goods between the two, governed by fairly rigid federal policies, is funneled along a few major trade corridors. 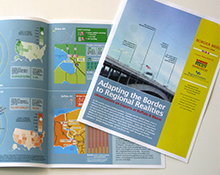 This Border Brief examines key border issues by looking at U.S. export activity in October 2007 through two of those corridors – Buffalo-Niagara Falls, NY, and Blaine, WA. This entry was posted on June 6, 2014 .